The Undergraduate Research Festival sponsored by the Center for Undergraduate Research (CUR) celebrated the breadth of research projects being conducted by undergraduate students and their faculty mentors in a variety of labs and classrooms across campus. The three-day event formally began with ribbon cutting ceremonies by President Dr. Paul Katz. From March 13 through 15, the festival hosted “Images of Research and Scholarship,” a visual competition featuring nine stunning images produced by undergraduate researchers on display in the atrium of the McNeil Science and Technology Center. In addition to faculty judges for the images, an online poll was held to determine a “popular choice award” from the CUR Facebook page. Two groups of elevator research talks featured undergraduates speaking about their research in non-specialist language to a broad audience. The elevator talks train undergraduates to communicate their science and scholarship in plain language to the community. 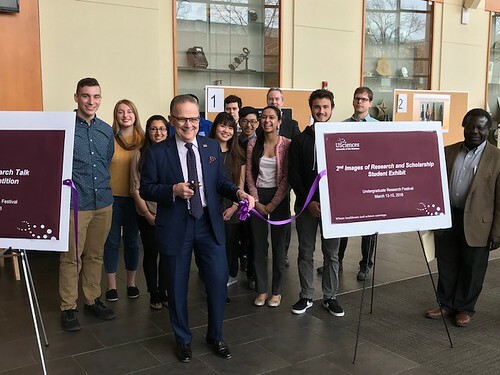 The festival continued with the Undergraduate Research Symposium featuring five oral presentations and 34 research posters, including from students from Ursinus College and Rosemont College. The evening was capped with award ceremonies and a video slideshow displaying the activities of CUR over the last year. Timothy Little PhSci'18 Evaluation of phenylalanine ammonia lyase activity in ethyl cellulose microcapsules. Nessreen Ghanem PharmD' 20 "Development of a Cell Based Assay for Evaluation of Neuroprotective NMDA Receptor Antagonists"
Timothy Little PhSci'18 "Evaluation of phenylalanine ammonia lyase activity in ethyl cellulose microcapsules"
Magdalena Kalinowska BC'20 and Klaudio Mehmeti BC'19 "Understanding and Removing the Dependence of SAM II RNA on S-Adenosyl Methionine to Form a Triple Helix by Site-Directed Mutagenesis"